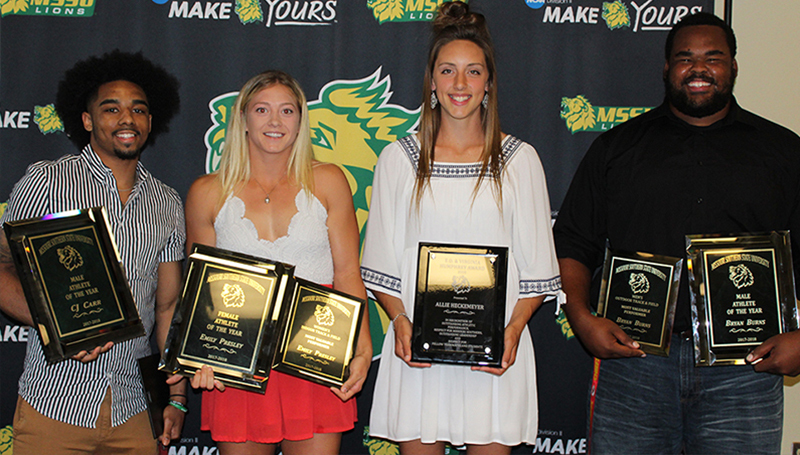 Missouri Southern senior women’s track and field athlete Allie Heckemeyer won the EO and Virginia Humphrey Award tonight as the Lions celebrated the end of the year Student-Athlete Award Banquet. Joining Heckemeyer with the big awards on the night was Emily Presley who was named the Female Athlete of the Year, as well as both Bryan Burns and CJ Carr who were Co-Male Athletes of the Year. This year, Heckemeyer was a Glen Dolence Award Winner given for leadership by Missouri Southern. She is also a two-time NCAA Elite 90 Award winner, which goes to the top GPA in the gender at the NCAA Championships site. Heckemeyer is the school record holder in the indoor and outdoor triple jump, as well as the indoor pentathlon and outdoor heptathlon and was All-MIAA this year in four different events. She was the MIAA Champion in the indoor pentathlon and outdoor heptathlon. Heckemeyer is a team captain, a member of Catholics on Campus, Delta Kappa and Alpha Chi honor society and K-club and maintains a 4.00 GPA in kinesiology. Presley was the MIAA Champion in the indoor and outdoor pole vault this year while winning the National Championship in the indoor pole vault. She is the MSSU school record holder in both the indoor and outdoor vault and with the exception of the Tyson Invitational, was not defeated in the pole vault during the season. Presley currently leads the nation by nearly four inches in the event and is one of only three individuals to hit the NCAA AQ Mark this season. Burns was an All-MIAA selection this outdoor season and was the MIAA Champion in the discus. He is the school Record holder in discus, indoor and outdoor shot put and hammer throw. He has 20 top-five finishes in the outdoor season, including ten event wins. Burns was the Regional Field Athlete of the Year and won the MIAA Field Athlete of the Week for three-straight weeks in the outdoor season. He currently ranks second nationally in the discus, ninth in the shot put and tenth in the hammer. Carr was an All-MIAA, All-Region and All-American selection this year. He was a member of MIAA All-Defensive Team and finished career with 1,111 points, 14th-best in MSSU history. He helped the team to a 20-win season and a trip to the NCAA Tournament and finished this season ranked 17th nationally in steals and 24th in assists, while leading the MIAA in minutes, steals and assists. Chelsey Henry won the Lion Service Award given annually to the student-athlete with the most community service hours in a year. She finished the year with 178 hours. The men’s track and field and cross country team won the team award for service hours. Below is a list of each of the Team MVP winners and Lionbacker Award of Excellence winners.